Healthcare and humanitarian workers are increasingly in the crosshairs as hospitals and aid centers have become part of the battlefield in today’s wars. So far, there has been little to stop the profound surge of violence seen across several open-ended conflicts that has claimed thousands of lives, destroyed health systems, triggered mass displacement and state collapse, and exposed the crisis facing the norms of international humanitarian law contained in the Geneva Conventions. 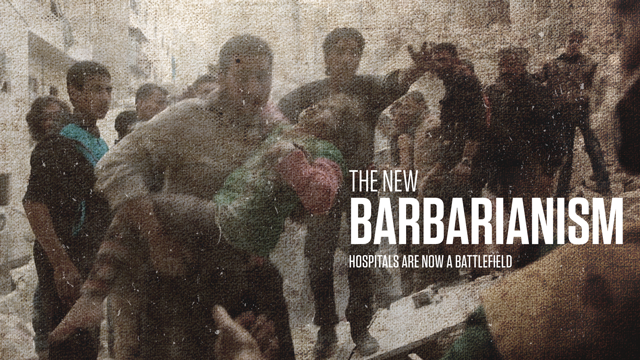 The New Barbarianism, an award-winning original documentary by the Center for Strategic and International Studies (CSIS) Global Health Policy Center (GHPC), examines the surge in violence against medical and other humanitarian workers. Rhode Island PBS announces the film’s public television premiere on Saturday, March 24, 2018, at 10 p.m.
“The continued escalating tragedies we witness in Eastern Ghouta in Syria attest that indeed we live in a barbaric era,” said executive producer and co-director J. Stephen Morrison, CSIS senior vice president and director of the Global Health Policy Center. “Our hope is that, in broadcasting this important film, Rhode Island PBS can stir deeper thinking about this poignant, timely topic among its viewers,” said Kenny, an Emmy and Peabody winning journalist and former foreign editor for PBS NewsHour. In addition to the local presentation, Rhode Island PBS is working with the film’s production team to facilitate distribution of the film to PBS stations nationally. The 58-minute film examines the crisis of targeted attacks on health care and humanitarian operations in today’s conflict, its causes, the limited international response, and possible ways forward through dozens of interviews, including Doctors Without Borders President Dr. Joanne Liu, U.S. Senator John McCain, and former British Foreign Secretary David Miliband. The film, which features original footage obtained from inside Syria, Yemen, and Afghanistan, builds on several years of prior GHPC work on the intersection of health and security, the role of militaries, and the human tragedies seen in Syria and Yemen. The opening chapter and discussion of The New Barbarianism was featured in the December 29 episode of the PBS NewsHour. At numerous screenings across the United States and Europe, including the recent Munich Security Conference, expert panelists have debated the options – diplomatically, legally, operationally – to protect medical and humanitarian operations and bring about greater accountability. For more information about the film, visit The Center for Strategic & International Studies.